Southend United have signed former defender Adam Barrett on a contract until the summer, while Wolves striker Jake Cassidy has joined on loan until the end of the season. 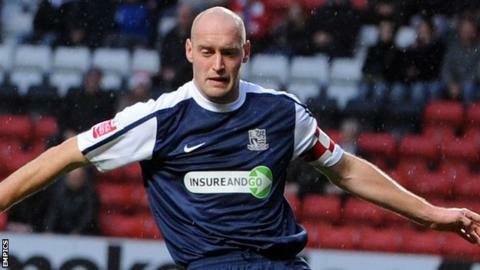 Barrett, 35, played 289 games for the Shrimpers between 2004 and 2010, and returns to Roots hall on a free transfer from Gillingham. He played 30 times while on loan at AFC Wimbledon this season. Cassidy, 21, had spent the first half of this season on loan at Notts County. He scored four goals in 20 games for the Magpies, and he was on target 17 times in 54 appearances across three different loan spells at Tranmere between January 2012 and June 2014. A Wales Under-21 international, he has played 25 times for Wolves since his debut two years ago. "I'm really pleased to have brought Jake to the club," said Shrimpers boss Phil Brown, whose League Two side have scored three goals in their last six games. "He's scored goals at a higher level and, despite his young age, has experience of playing games. It's a fantastic signing for us." On Barrett's arrival, he told BBC Essex: "He's a real leader and a fans' favourite during his time at the club previously. "He's determined, knows the division very well and has a determination and desire to do well here and help us achieve our goals."